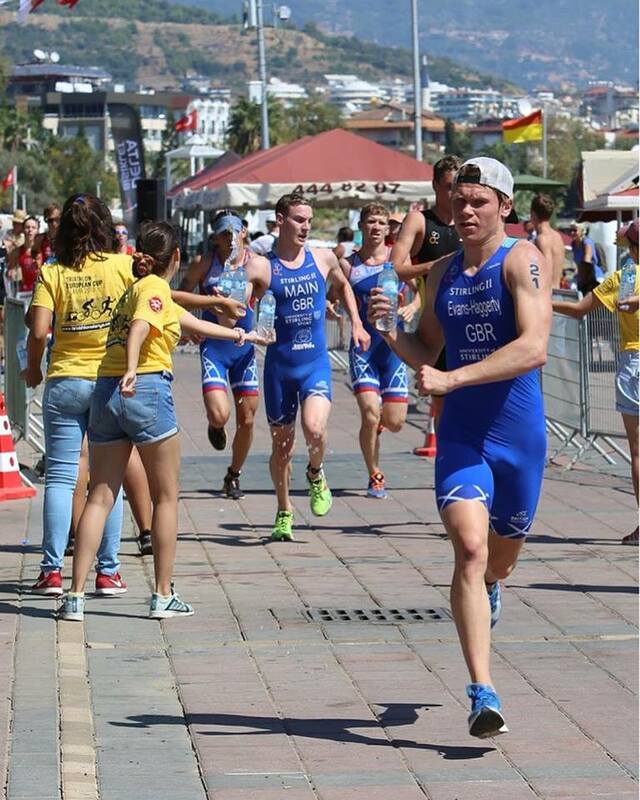 Studer’s stunning gold makes it three wins in Alanya. 26.09.2018 Saturday saw thrilling racing in Alanya. 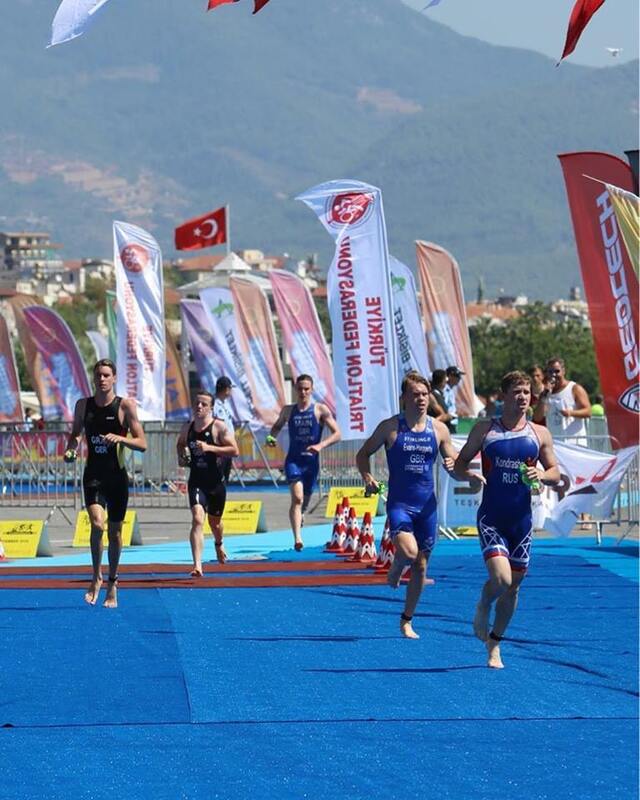 Between each the Elite and Junior races, the LOC had scheduled a whole range of events for the Turkish Federation and athletes from all over Turkey made their way to race with the famous blue-carpet finish in front of the Town Hall. The legacy of this event has grown over the years and is now, back and going strong. For the Elite Men, we had our eyes on Spain’s Roberto Sánchez Mantecón. Perhaps we should have paid more attention to the recent results on the track by Max Studer SUI. He became Swiss U23 champion over 5k with an impressive new PB of 14:20.89. Added to the fact that he has won here twice (as a junior) and he was on familiar ground and in great form. GB’s Nathan Tweedie led them out of the two-lap 1500m swim (oh, by the way, the water was 30.9C and the air 32.5C, quite unlike the torrential rain that some of us had), with Alexander Bryukhankov RUS a few paces back. By the time the athletes had run up the beach, along the blue carpet to T1, there was a group of almost 20 charging into the wide transition area. 20 athletes packed into the first 15 seconds and Studer alongside his younger brother, Felix. 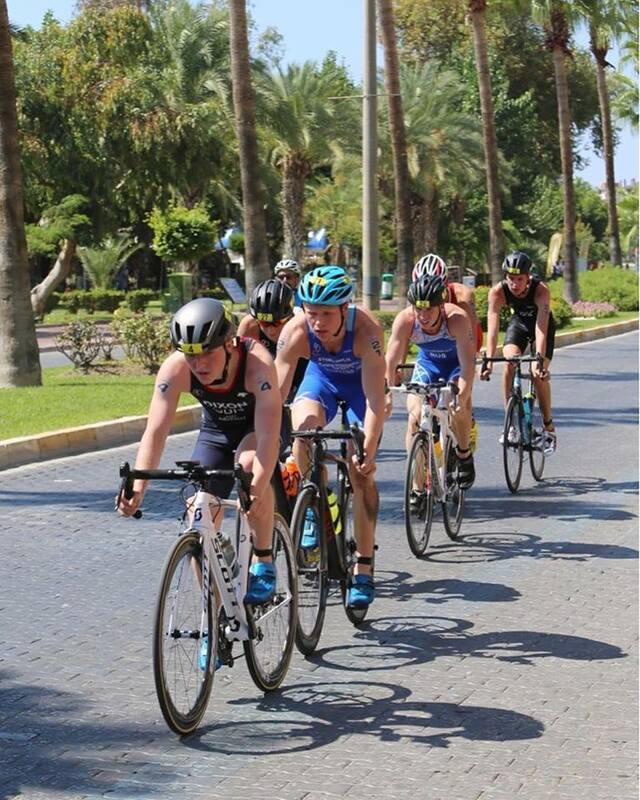 As the athletes set out on the bike, the more experienced ones amongst them set about upping the pace to drop as many as possible and soon enough they pack had thinned out but in that group was Sánchez Mantecón and of course Bryukhankov. 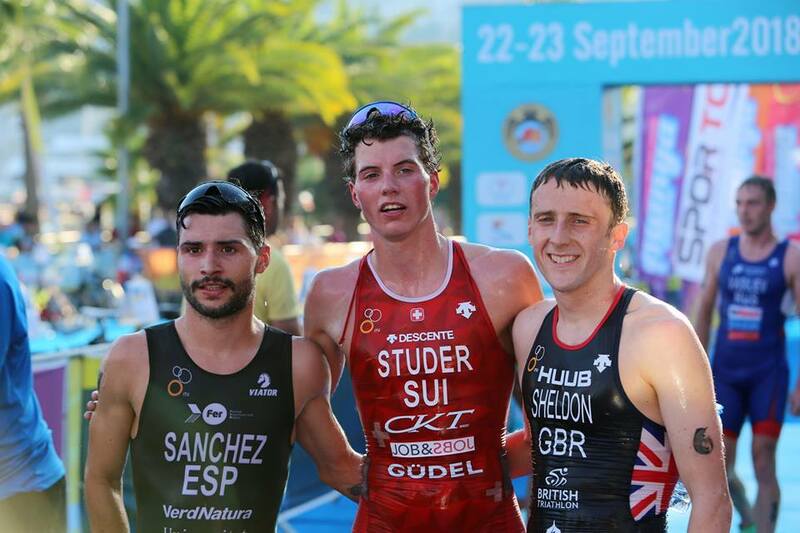 Working hard within the pack was Grant Sheldon GBR. The pace was not going to ease off as the athletes came through the transition area again and again on this fast and flat course, with its technical turns. Coming into T2 the athletes must have known that the final 10k would be tough. The heat was immense and the run course, with its four laps, leg-breaking climb, flat sections exposed to the burning sun would soon see the stronger runners take full advantage. Despite the heat and sunshine, Scotsman Sheldon not only survived but appeared to be getting stronger. It was Sánchez Mantecón, Sheldon and Studer who moved to the front and Studer, with that added power from his recent training camp, who had the pace. The Swiss athlete claimed the title, the gold medal, the prize-money, the points and the glory of becoming a three-times winner. Behind him, Sánchez Mantecón had enough to keep Sheldon, who had the second-fastest run of the day, at bay. 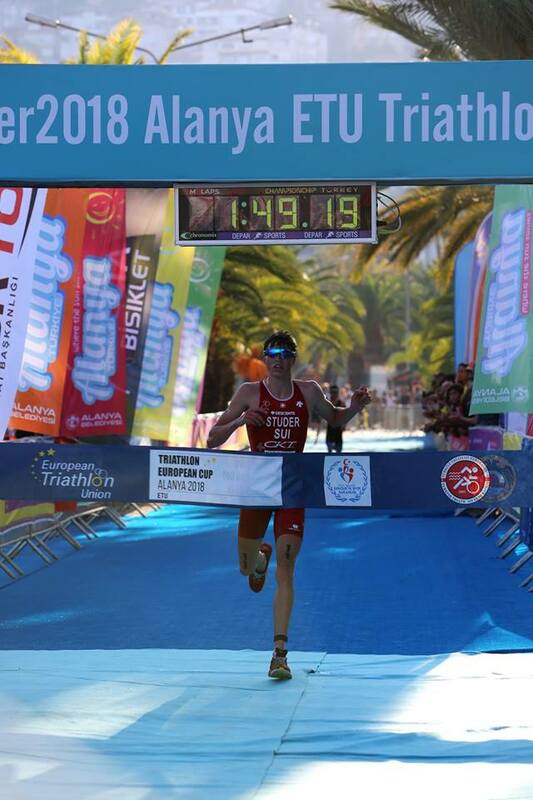 With just one race left on the calendar, this result has shifted the Spaniard into a strong position behind Tamás Tóthand Márk Dévay in the ETU Rankings. Funchal could see him collecting a great end of season bonus. The Junior Men had raced earlier in the day but even then, conditions were pretty tough with the water temperature at 29.9ºC and the air at 32.9ºC. Race favourite, Daniel Dixon GBR, was well-placed in the swim as he exited behind Henry Graf GER. Between the German leader and the Brit were Daniil Kondrashov, who had shown some good form last year but had failed to translate that into good results in 2018. GB’s Guy Evans-Haggerty was there at the front too to ensure that the bike pace would be high. The leading pack dropped some of the slower cyclists and then worked hard to build the lead. With some 15 athletes pushing the watts, the crowds were treated to an exciting bike leg before the final 5k. It was here that Kondrashov kicked and left everyone trailing. His 16:49 in this heat, on such a course, was unbeatable and secured him a well-deserved victory. Behind him the two Brits were having a battle of biblical proportions. A Geordie against a Scotsman, both from the very northern reaches and both in heat that was never likely to be found in Newcastle or Glasgow. This time round, it was Dixon who would watch Evans-Haggerty pull away and with the second fastest run of the day, silver and bronze were shared by these two promising athletes. 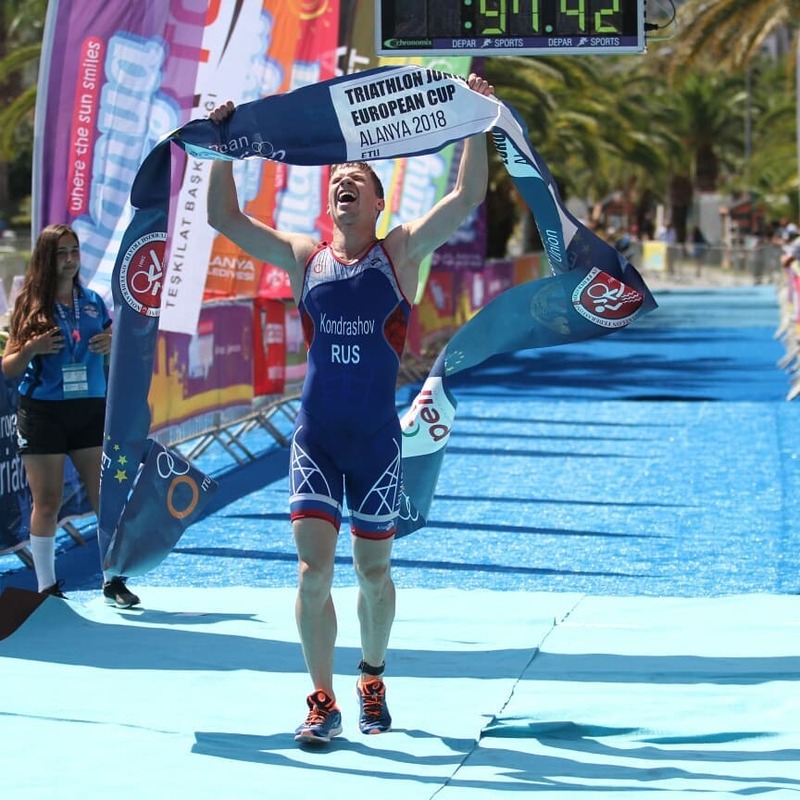 The results for the juniors have been put into the massive ITU Results Machine and the result from the Brits has moved them up to 5th place behind Israel, Italy, Austria and the leaders, France. Funchal will be the decider. Thanks to Yasemin Taşçıkaran and to Feyzi Açıkalın for the pictures. No content and material can be copied without permission.